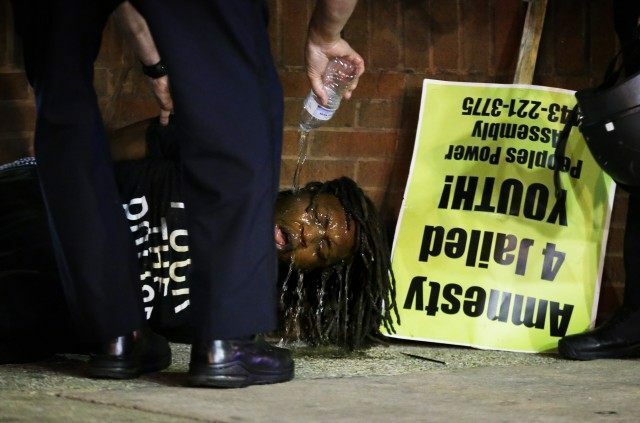 Baltimore police took several people into custody just minutes after the 10pm curfew went into effect Saturday, including one man who was pepper-sprayed and dragged from the street before being detained. The number of arrests made Saturday after the curfew is unknown, but NBC News reports that at least two men and three women were seen being put into a police van near a burned CVS pharmacy. In an incident caught on video, one protester stood before officers wearing a t-shirt that read ‘F*** the police’ and refused to move before on policeman used his pepper spray. The defiant activist collapsed, was handcuffed and received medical treatment from officers. Handcuffed and propped against a building, the man is seen falling over repeatedly as officers pour water into his eyes in an effort to ease the effects of the spray.